Juliet Peter, painter, printmaker, potter and designer died in Wellington on 12 January, aged 94. Earlier this week several Te Papa staff attended her funeral. An early practitioner of studio ceramics in New Zealand, Juliet’s work was stylish and individual. Her commitment to clay led to her close association with the magazine New Zealand Potter, which she and her husband Roy Cowan worked on from 1962, along with founders Doreen Blumhardt and Helen Mason. Juliet developed the drawings and designed the magazine’s layouts. As well as painting and pottery, design was an important part of her work. Juliet was a longstanding contributor to the School Journal and brought a lively, personal touch to her designs and illustrations. Te Papa holds watercolours, lithographs and pottery by Juliet. This stoneware branch pot is an elegant example of her salt glazed works, which have minimal decoration but a strong emphasis on form. 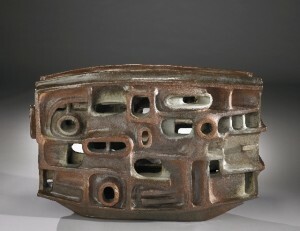 Small branch pot, circa 1975, by Juliet Peter. Purchased 1975 with G.G. Gibbes Watson Bequest funds; Te Papa. 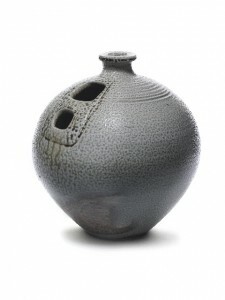 The pot was fired in the kiln built in Ngaio, Wellington by Roy Cowan in the mid 1970s. Like Juliet, Roy was also a painter, printmaker and designer, and theirs was a considerable creative partnership. He passed away in 2006. Lantern, 1966, by Roy Cowan. Purchased 1966; Te Papa. We offer our sympathies to Juliet Peter’s family. She leaves a legacy in twentieth century New Zealand art and design that will long be remembered. I am researching Juliet Peter for an exhibition “Tall Women Standing Strong” we are having at our local Marlborough Art Society Gallery celebrating 125 years of Women’s suffrage movement. I also enjoy watercolours and printmaking and would like to pay tribute to her by creating a fitting portrait of her. Do you have any photos of her please as to date I have only found one self portrait and a possible drawing of herself as a land girl? Although I can find lots of images of her art I would be grateful for any information about her looks, appearances and personal style of dress in various settings. I have read about her life on the farm and actually grew up at Montalto which is adjacent to Anama where she first lived. Were there any other artists that may have painted or portrayed her in a life drawing class or other event? An earlier image from the 1960s is one taken by Marti Friedlander and now held by the Auckland Art Gallery. It shows Juliet with her potter husband Roy in the 1960s.Do go the gallery’s website to find it/ or enquire. I hope that these help you. Thank you for your enquiry. Do let me know if you have contacted the family of Juliet Peter. I can check our records should you need any help with permissions. Did you manage to get hold of anyone re Juliet Peter? we would like to contact the family of Juliet Peter to enquire about permission for the use of a piece of her artwork that we found on the cover of a 1956 School Journal. Can anyone please help us with an appropriate person’s contact details.